If you love pizza, then we have a breakfast you are going to really love. 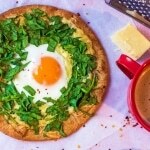 Using a pita bread as the base, it’s then loaded up with spinach, cheese and egg to make a protein packed Breakfast Pita Pizza. Divide the cheese and spinach between the two pitta breads leaving a circle in the middle. Crack the egg into the middle and place in a pre-heated oven at 200°C for around 10 minutes, or until the egg white has cooked.